The landmark Americans with Disabilities Act (ADA) does many things. Title I prohibits employment discrimination on the basis of disability and requires employers to make reasonable accommodations for qualified individuals with disabilities. Title II requires governmental agencies to make sure their services are accessible to persons with disabilities, and Title III places accessibility requirements on private business open to the public, so-called public accommodations. 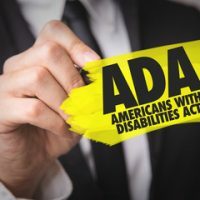 Organizations that run afoul of the ADA risk being sued by the EEOC, the DOJ, or private persons, with significant monetary penalties and money damages imposed for noncompliance. What does all this have to do with your law firm website? First of all, law offices of any size, from solo practitioners to international firms, are expressly designated as public accommodations within the meaning of Title III (with 15 or more employees, you are covered under Title I as well). As a Title III entity, the services you provide as an attorney must be accessible to persons with disabilities. This can mean much more than ensuring your office is accessible to persons with physical disabilities. As more and more of your services and the way people access your information is integrated with the Internet, the more likely it is that your website must be accessible as well. What Exactly is an Accessible Website? Web standards are set by the World Wide Web Consortium, commonly known as W3C. Through their Web Accessibility Initiative (WAI), W3C has developed and promulgated the Website Content Accessibility Guidelines (WCAG). The first set of WCAG were released in 2008, and the current iteration is WCAG 2.0, which were released in 2012 and have been adopted as an ISO standard. WCAG 2.1 is currently under development and may be released sometime in 2018. WCAG 2.0 standards have three different levels of compliance – A, AA and AAA. The standards at each level address topics such as having alternative text options for images and other non-text content. This may include subtitles or captioning for video, spoken text that integrates the website with the user’s screen reader software, larger print, or simpler language. Other standards address items such as keyboard operations, timed interactions, flashing images, and website navigation. What is Your Liability Exposure? A Title III complaint could be brought by the Attorney General or a private person. The remedy is primarily for injunctive relief, but an AG suit could pursue civil penalties as high as $92,383 for a first violation and $184,767 for a subsequent violation. A prevailing party can also be awarded attorneys fees. The availability of money damages depends upon state and federal law in your jurisdiction. For instance, California law allows for actual damages plus treble damages and attorneys fees under both the Unruh Civil Rights Act and the Disabled Persons Act. Also, if you are covered as an employer under Title I of the ADA, you could be liable for money damages in a discrimination lawsuit under certain circumstance, for instance if your website serves as a recruiting tool or application portal. So does your law firm website need to meet WCAG 2.0 standards, and if so, should you adhere to the A, AA or AAA level of compliance? The answer to this question may depend upon what federal judicial circuit you are in, but the national trend is moving toward requiring every Title III public accommodation website to meet WCAG 2.0 AA. WCAG 2.0 AA has been the standard for all federal agency websites since January 2017, and the Department of Justice has used AA as the standard in settlement agreements with Title III entities, including a complaint settled with the Law School Advisory Council (LSAC) and law schools nationwide. Currently there is a split in the federal circuit courts over the applicability of the ADA to websites for Title III entities. The First, Third and Seventh Circuits have all held that the ADA applies to websites, regardless of whether the company has a physical location or is on-line only. To-date, courts in the Sixth, Ninth and Eleventh Circuits have required a sufficient nexus to a physical location in order to require that the website be accessible as well. In addition to avoiding lawsuits and expensive penalties and money damages, having a website that is WCAG 2.0 compliant may arguably help your website get better rankings from Google and the other search engines. Also, it goes without saying that the more accessible your website is, the more people can access your website, and the greater your website’s reach to potential clients. Likely thousands of prospective legal consumers search the web everyday looking for legal information or to hire an attorney, but due to their needs are only able to access websites that meet WCAG 2.0 accessibility standards.